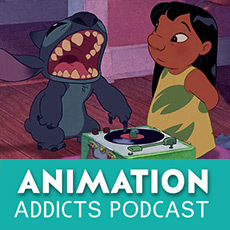 It’s the annual Halloween episode of the Animation Addicts podcast and, even though we’re not reviewing a spooky film, the Rotoscopers still got dressed up in their costumes to review Disney’s 2002 animated film Lilo & Stitch. It’s a special Halloween episode, during which the Rotoscopers dressed up in costumes. Mason’s No Face costume FTW! Stitch mania was everywhere! Stitch is incredibly popular in Japan. The film’s marketing and Stitch-takeover trailers. Character designs are so appealing, yet much different from typical Disney animated films. Lilo and Nani are the breakout characters! Film explores the themes of loneliness, broken homes, adoption, and more. The music. Not your traditional Disney musical. A few Hawaiian-esque songs plus Elvis Presley. Listener question: Who is your favorite character in Lilo & Stitch and why? Don’t forget to use the hashtags #AnimAddicts and #AnimAddicts106 when talking about this episode on Twitter!